As US authorities close in on the BitConnect Ponzi scheme, it appears the top US BitConnect affiliate investor has gone into hiding. In YouTube video footage dated early September, 2017, Arcaro boasts of generating $4.7 million dollars in BitConnect downline investment, netting him referral commissions in excess of $70,000. 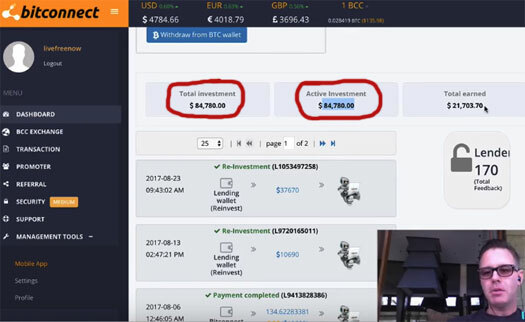 At the time Arcaro’s BitConnect backoffice showed an investment balance of $310,741. $84,780 appears to have been personally invested by Arcaro, with ROI payments totaling $21,703. How much Arcaro made in excess of that over the past five months is unclear. At an exclusive BitConnect “yacht party” held for top US investors, an evidently tipsy Arcano boasted to those in attendance about how much money he was making. In the first video referenced above, Arcaro claims he has a “special position here with BitConnect as the national promoter … for the United States”. [3:22] I feel really honored and blessed to be in this position. I feel really grateful for it, to be the top promoter in the US, y’know for BitConnect. As reported last week, on January 4th the Texas Securities Board issued BitConnect with an securities fraud cease and desist. This was followed by a January 9th securities fraud cease and desist issued by North Carolina. It is expected over the coming weeks that other US states and likely the SEC on a federal level will follow. On or around the time the North Carolina cease and desist was issued, Glenn Arcaro’s Future Money website was pulled offline. The Future Money website forum was widely regarded as a primary community and source of information for US BitConnect investors. 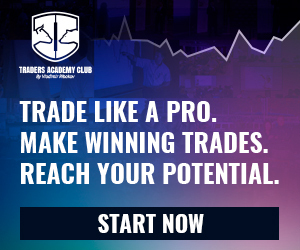 Arcaro used the Future Money website and forum to build his BitConnect downline through his “livefreenow” affiliate referral link. This is the default message shown when a vBulletin forum is taken offline. Arcaro has also deleted his YouTube channel, which was full of BitConnect promotional material. To the best of my knowledge no explanation as to why Glenn Arcaro has tried to scrub his involvement in BitConnect off the internet has surfaced. As we’ve just learnt of the USI-Tech investigation, it is highly likely that the regulatory investigation into BitConnect extends well beyond Texas. That the SEC and possibly international authorities are involved is almost certain, given the global scope of the BitConnect Ponzi scheme. According to his Twitter profile, Arcaro is based out of California in the US. 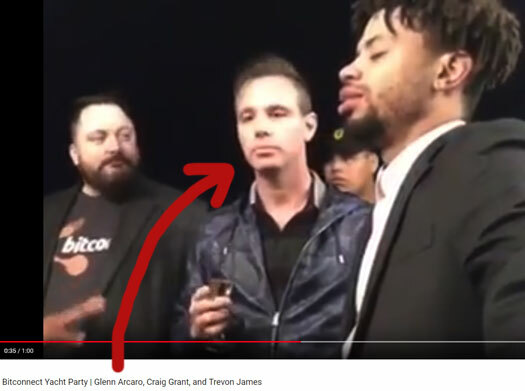 If Glenn Arcaro isn’t directly involved in the operation of BitConnect himself, then there’s a good chance he at least knows who is. In September 2017 Arcaro along with fifteen other Directors incorporated BitConnect International PLC in the UK. The stated nature of business is “fund management activities”. Since the Texas cease and desist the value of BCC points has plummeted by 34%. The company yesterday attempted to generate ROI revenue through the launch of a BitConnectX ICO. Based on the going price of $50 per BCCX ICO point and 11,760,000 pints on offer, BitConnect is hoping to raise $588 million dollars. US affiliates however have been barred from participation. At least officially. It’s expected whatever is raised through BitConnectX will be used to prop up BCC’s value and sustain ROI payments for a while. When the owners decide to pull a runner or authorities move in to shut BitConnect down remains to be seen. Other than cooperation with US authorities or packing up and preparing for life on the run, I can’t see why Arcaro would all of a sudden nuke his BitConnect promotional efforts. Can you? Next story LipCoin Review: A cryptocurrency for the surfing community?